Using LinkedIn is one thing, but getting results is where the rubber (or tracks) meets the road. 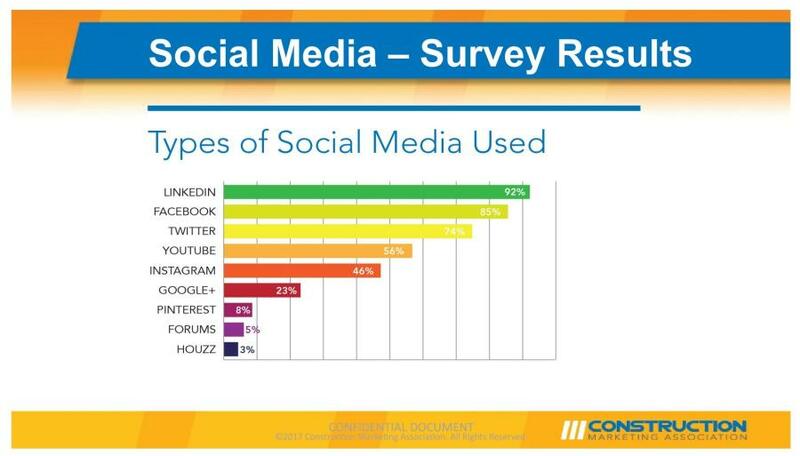 LinkedIn remains the undisputed champ among social media platforms for the construction industry, according to survey results rolled out at the Construction Marketing Association's 2017 Social Media Summit. In fact, it far outranks other platforms, including the 800-lb.-gorilla Facebook, with a whopping 92 percent using it. Using LinkedIn is one thing, but getting results is where the rubber (or tracks) meets the road. 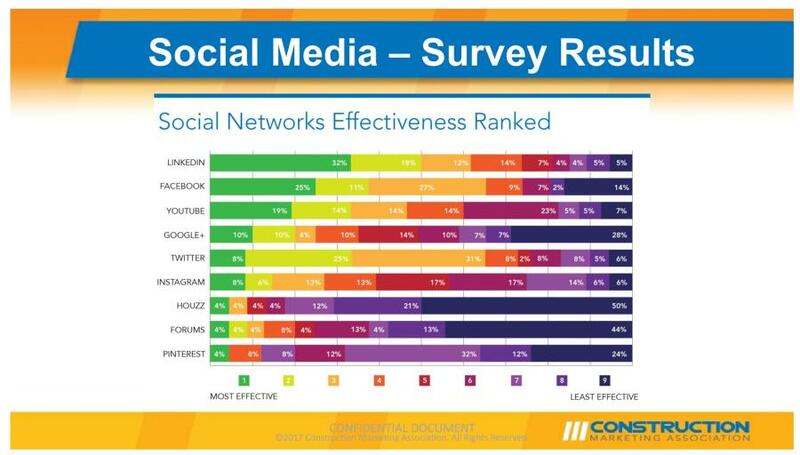 The "Social Networks Effectiveness Ranked" graph in the images above suggests that construction firms agree with my assessment that it should be their number one social media marketing priority. If you have a personal LinkedIn profile, you're already one step ahead, but there is still room for growth. Below I will lay out the added benefits your construction firm can realize by building and updating an active company page. LinkedIn has been branded as a recruiting platform since so many recruiters (and businesses) use it to find talent. It is, after all, an online resume for many of us. The reality is that it's ideal for business-focused social media users and has a great deal of untapped potential. Is it safe to say the biggest issue facing the construction industry is the labor shortage? Is it also fair to say that most people don't scan the classified section of the newspaper to find jobs these days? The talent you seek can be found on LinkedIn, from laborers to vice-presidents. Having a company page gives them a place to learn more about your company over time. That also means they'll be more likely to see any posted job openings. Prospective customers are researching your firm online before you even get an email or phone call. It's likely that they'll do a Google search and click on a result or two from the first page of results. Having a LinkedIn Company page improves the odds that your firm will show up in the first page of Google. A search might pick up a key word in your profile, or even a post. Think of a LinkedIn company page as a supplement to your website. It's another place to post company news, jobsite photos, new products and services, equipment in action, and much more. The beauty of it is that prospects that follow you can keep up with your news on their time. And if they stumble onto your page, they'll get an immediate feel for your firm, including a brief company profile and some recent updates. And don't forget creating a profile and posting on LinkedIn is basically free. 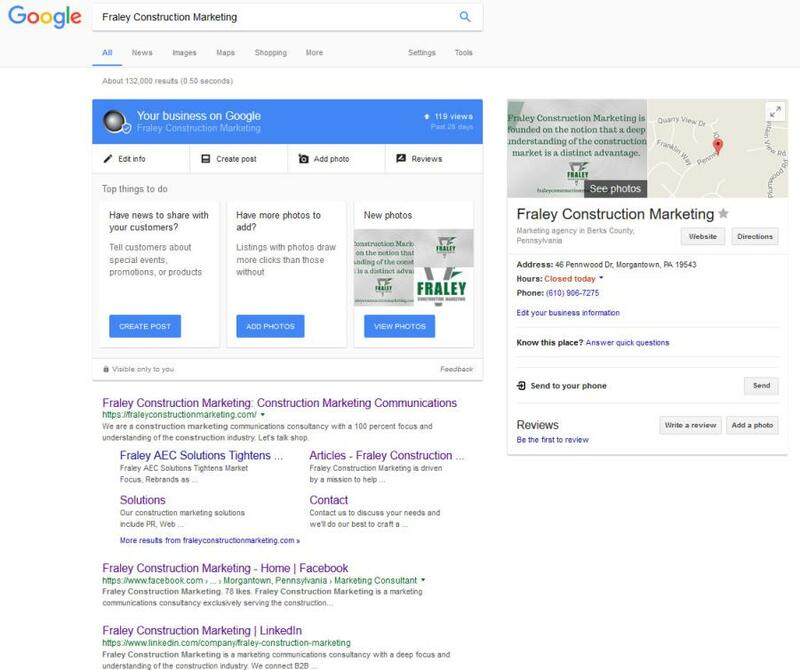 Your only cost is for content creation, regardless of whether you do it in-house, or outsource to a firm like Fraley Construction Marketing. Did you notice that I used the word “potential” above? 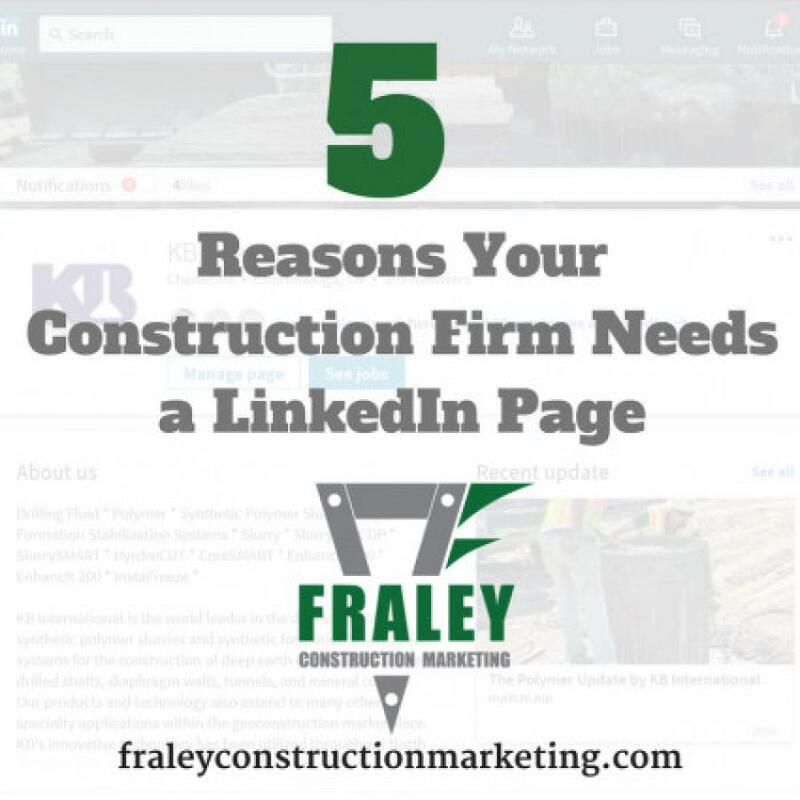 No matter how strong your culture or how dedicated your employees are, it's a tough haul for most construction firms to get the majority engaging with and spreading the company's content on LinkedIn or any other platform for that matter. This is really the Holy Grail for social media because the compounding effect can exponentially improve your results. 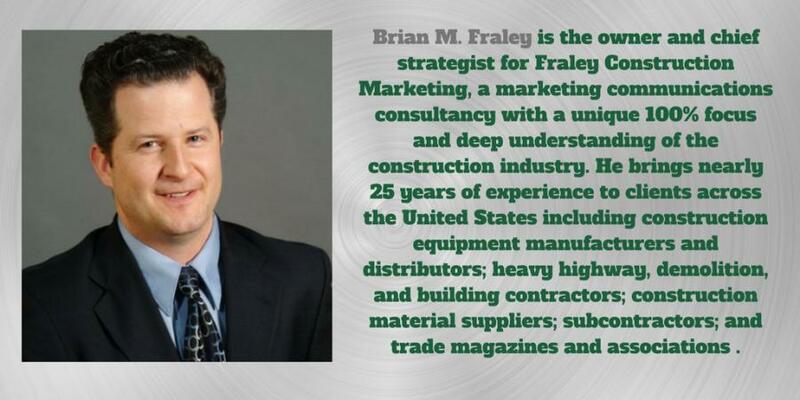 Whether you need a LinkedIn profile created, graphics designed, or complete turnkey management of your firm's social media presence, click here to learn more about Fraley Construction Marketing's services.